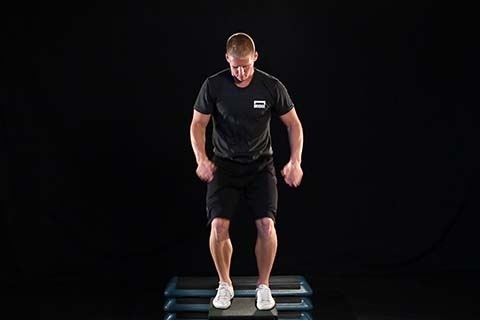 The Seated Box Jump is a great exercise to teach hip speed and coordination. Like the regular Box Jump, try to use a soft box, such as a gymnastics box, instead of a metal box. Initially, set the box up at knee height. You will also need a box or bench to sit on. Make sure seat allows for a hip-knee angle just above 90 degrees to start with. As you improve over time, you can lower the height of the box or bench. Start seated in front of the box with your feet hip-width apart, hands in your lap. In a smooth movement, swing your arms back and out to the side as to avoid scraping the box/bench. Swing your arms forward as you move to stand up and jump onto the box. Focus on making this one movement, that is, not stand up, then jump. Instead, make the transition as smooth as possible. Land softly on the box with your feet hip-width apart, a slight bend in your knees and knees in-line. Do not land with your knees locked out. Stand up from this position. Step down slowly from the box and resume starting position seated on the box. Repeat for prescribed reps.